Mapping where homes are out of reach for the median family. 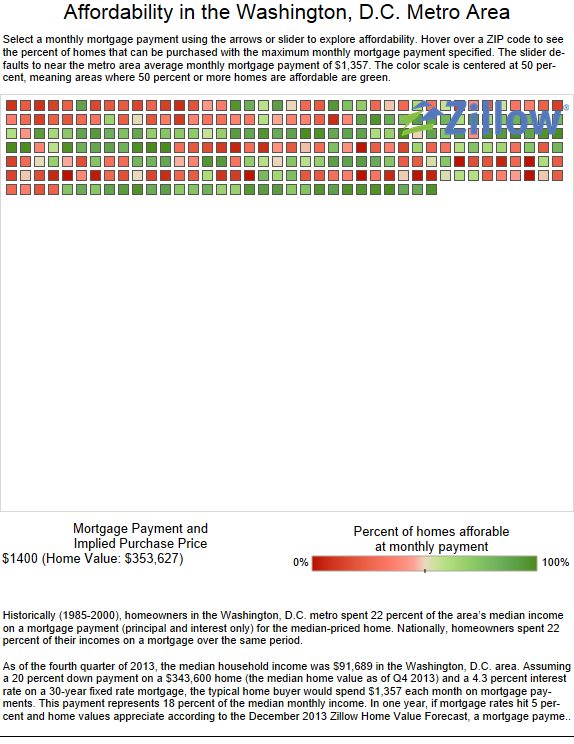 New data and maps from the real estate research firm Zillow shed light on the uneven nature of housing prices across several major U.S. cities and metros. One commonly held metric is that families should devote no more than about 28 percent of their incomes to housing. But in certain parts of the country, that's easier said than done. 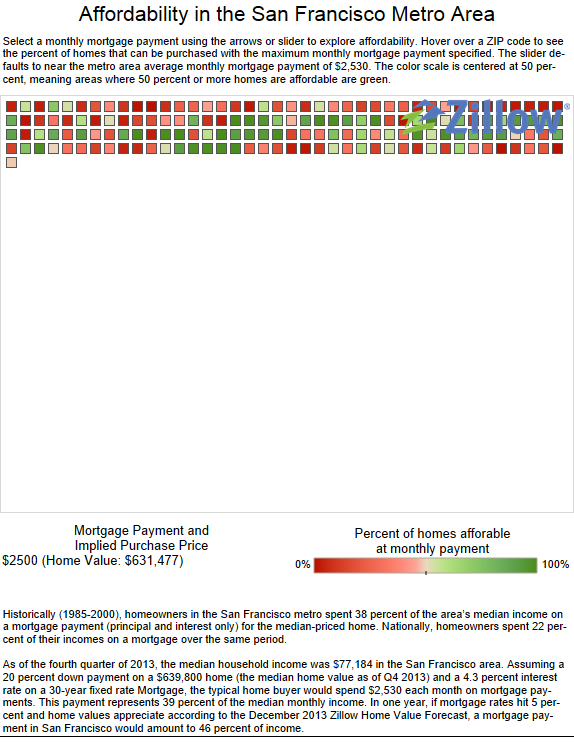 By the end of last year, the median family would need to devote much more than a third — up to nearly forty percent — of its income to mortgage payments on the median home in metros like San Jose (36 percent); San Francisco (39 percent); and Los Angeles (40 percent). These proportions are even higher than in the pre-bubble, pre-crash period of 1985-2000, when the median household would have needed to devote still substantial percentages of its income to afford the median house: 32 percent in New York; 35 percent in Los Angeles; 35 percent in San Jose; and 38 percent in San Francisco. And within metros, the locations of homes that are within reach for the median family vary substantially. 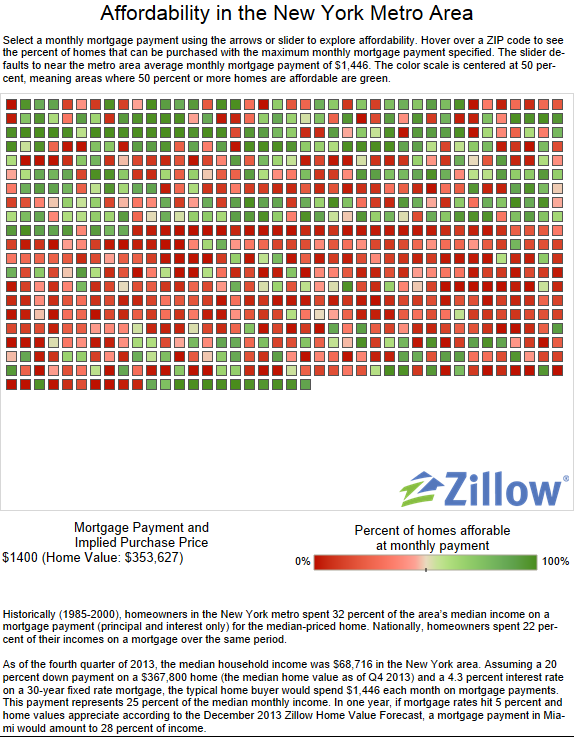 The maps below, from Zillow’s Krishna Rao, track by zip code where the median family can and can't afford a mortgage. 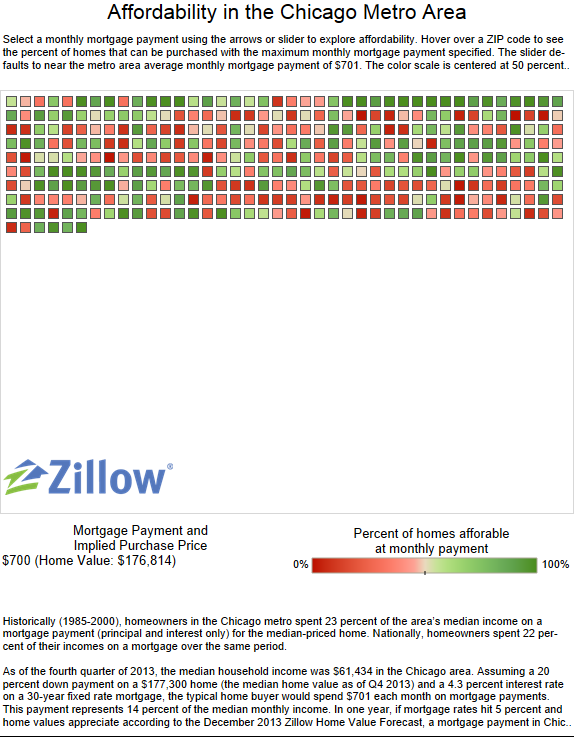 In green are the zip codes where more than 50 percent of the homes are affordable for the "typical" home buyer (for more on methodology, see below, and the explanations on Zillow’s site). In almost every case, housing is least affordable near the center and in close-in, walkable suburbs with access to transit. These maps look strikingly like the ones from America’s Class Divided Cities that I published last year on this site. Those maps showed a similar pattern of advantaged knowledge workers at the urban center, in close walkable suburbs, around knowledge-based institutions, and clustered along natural amenities like waterfronts and coastlines. This geographic sorting of housing prices across and within cities and metros is a major contributor to the economic segregation of American cities, a topic that I have been tracking closely over the past few weeks. In some of the most advanced and prosperous parts of the country — from the Bay Area to the Acela corridor — large parts of the gentrifying central city and many of the close-in suburbs are totally unaffordable for all but the truly advantaged. In San Francisco, affordable areas are clustered in the East Bay, in Oakland and further out, far away from the gentrified, tech-driven center city. In Chicago, affordable homes in the city are clustered on the South Side, while the only affordable suburban areas with large proportions of affordable homes are far out in exurbs of DeKalb and McHenry counties, and over the border in Wisconsin and Indiana. In D.C., more homes are affordable to the median buyer in the close-in suburbs to the south and east of the city, as well as the exurbs of Northern Virginia and Maryland’s Frederick County. 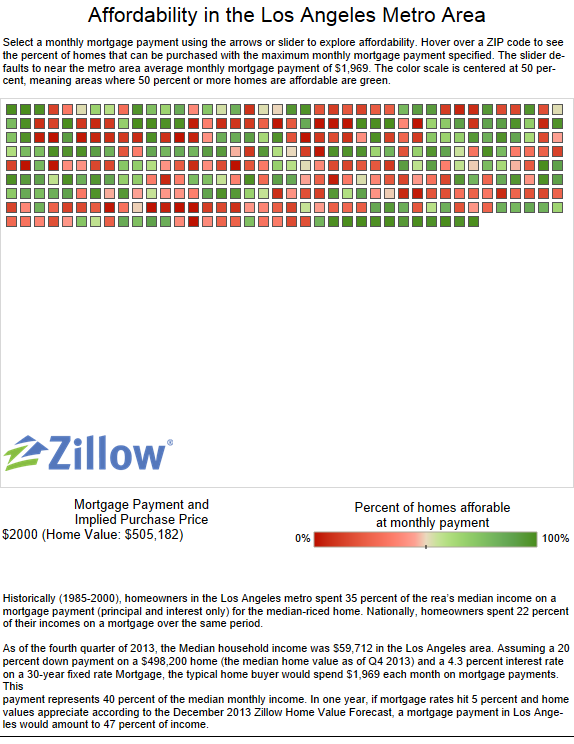 In Los Angeles, houses require mortgage payments below the area median in areas south of downtown and in the northern suburbs of Los Angeles County. In New York, mortgages are at above-median levels in all five boroughs of the city, the North Shore of Long Island, Westchester, and parts of New Jersey. Affordable mortgages are found in Long Island’s Suffolk county and the further suburbs of New Jersey.